This post is sponsored by Garnier. 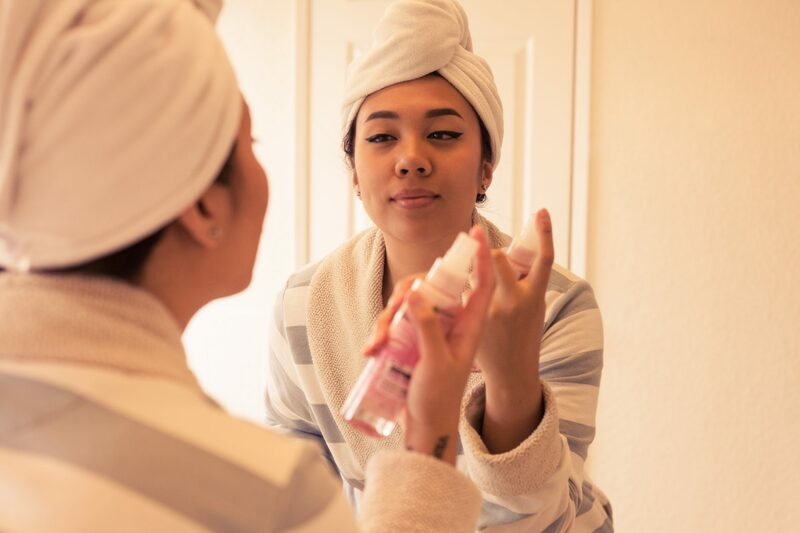 As you might already know, I’m a firm believer that you don’t have to shell out tons of money to get the proper skincare products for radiant and healthy skin. With drugstore beauty products being so affordable, there’s hardly an excuse to get a complete regimen that covers each step of your regimen. However, the step that’s most important is often overlooked: cleansing. Most people buy a facial cleanser, slather it all over their face and call it a day, but if you wear makeup on a daily basis like me, then I can’t stress enough how important it is to thoroughly remove your makeup before applying the rest of your skincare products. Did you know that rinsing once with face wash isn’t enough to remove all the dirt, oil and bacteria after wearing makeup? It’s true! 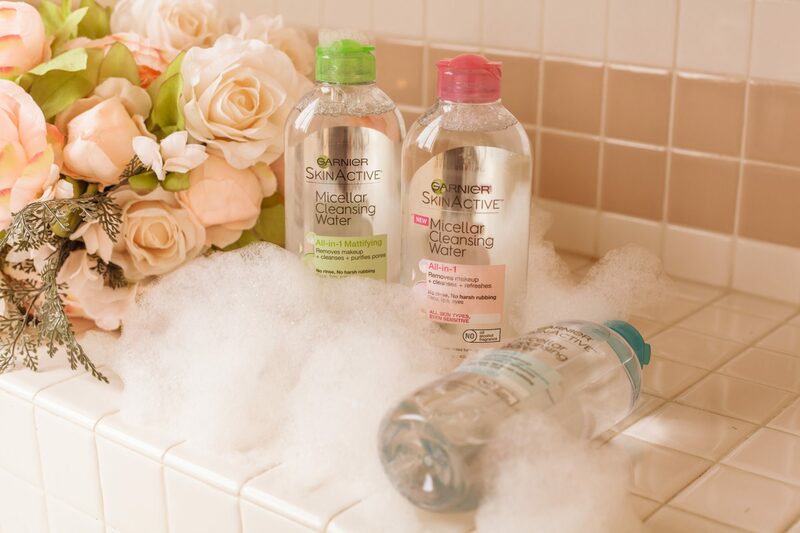 Enter Garnier’s SkinActive Micellar Cleansing Water: it’s an all-in-1 cleansing water that removes makeup, cleanses, and refreshes your skin. 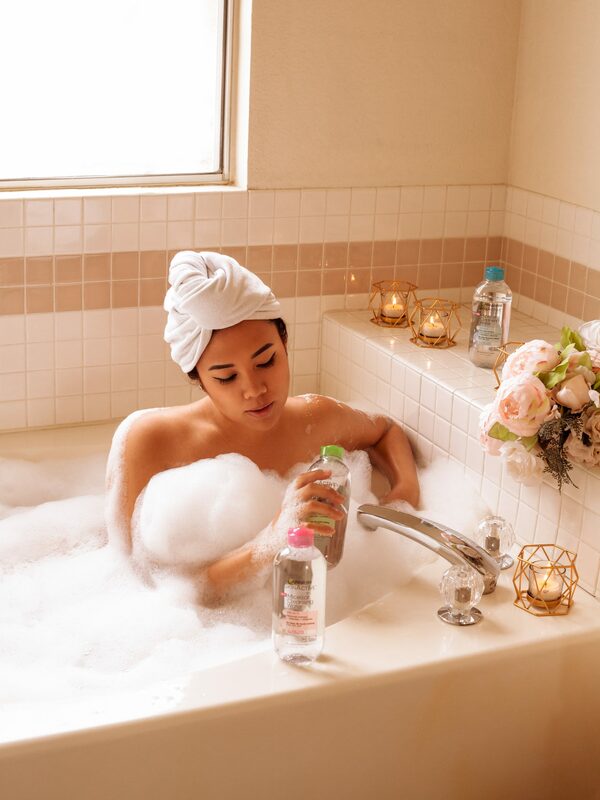 It’s not an oil-based cleanser, although the formula consists of tiny “micelles” – tiny balls of cleansing oil molecules – that are suspended in soft water, so you get the effectiveness of a cleansing oil with the consistency of water. It’s perfect for people like me whose skin is extremely reactive to oil-based cleansers, so we can still have our cake and eat it too! 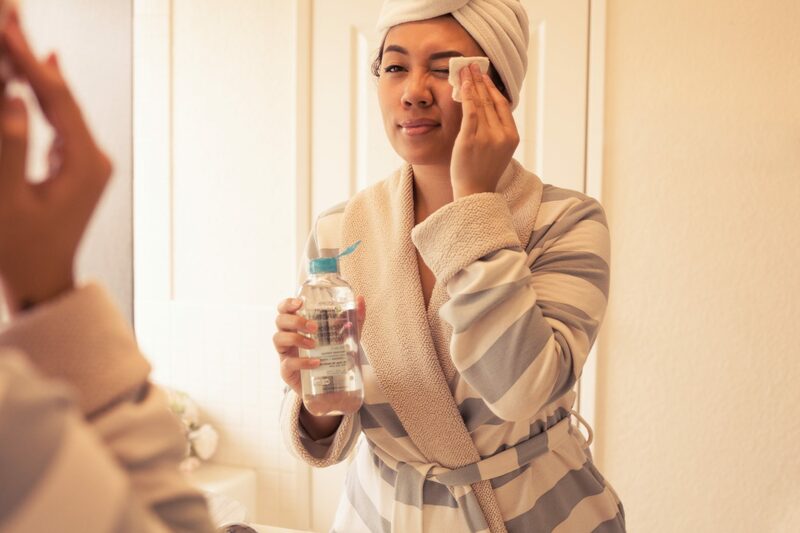 Using the Micellar Cleansing Water is super easy: I simply saturate a cotton round with the solution and let it soak on my eyelids for a few seconds to break down my makeup, and then wipe down my entire face. Then I proceed with using a regular facial cleanser. By adding this into my regimen as a pre-cleanser, I ensure all of my makeup is removed before layer on my serums and moisturizers. And here’s a dirty little secret of mine: during nights where I stay up far past my bedtime, I can simply wipe off my makeup with it, slap on some moisturizer and jump right into bed – no rinsing needed! Of course, I don’t recommend doing this every day as it’s important to get a thorough cleanse,but it’s good to know that you don’t have to completely sabotage your skincare regimen from one night of partying too hard. But don’t say I didn’t tell you! The SkinActive Micellar line features 3 different formulations: the original All-in-1 Cleanser, the All-in-1 Cleanser and Waterproof Makeup Remover, and the All-in-1 Mattifying Formula, which is great for oily skin. If you have sensitive skin, the original formula is more up your alley; if you wear waterproof eyeliner or mascara, you might want to consider the waterproof formula as it breaks down waterproof makeup with ease. I also wanted to give some special attention to the SkinActive Soothing Facial Mist: if you suffer from dry skin, you’ll definitely need a bottle of this on your work desk and in your medicine cabinet. The Soothing Facial Mist contains rose water, which helps retain moisture and calm stressed skin. Winter is almost here folks, so you should definitely have a bottle on hand! I’ve been using Garnier’s Micellar Cleansing Water for several years now and can’t get enough of it. In fact, I featured it on one of my most popular blog posts (see: 10 Dupes For the Most Popular Skincare Products of 2017) as one of my holy grail skincare staples. It truly competes with many of the more pricier micellar waters on the market for just a fraction of the price at just $8.99. 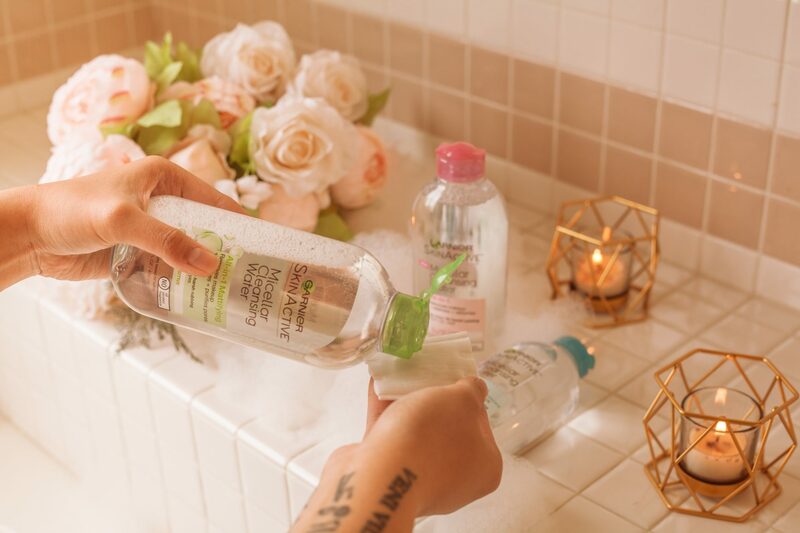 Have you tried Garnier’s Micellar Cleansing Water yet? Use code “GRNSAVE2″ to get an extra $2 off your micellar purchase at Ulta.com. Let’s chat in the comments and don’t forget to subscribe to my newsletter below for more budget-friendly skincare tips and tricks. Great, in-depth post (as always)! I also used the Garnier micellar water (the blue bottle), and was so impressed with how thoroughly it took my makeup off. I’ve been using a witch hazel toner for a while now (after I ran out of the Garnier), and while it also removes makeup, I can’t help but wonder if I’m not getting all of it off. Once I run out of that, I’ll definitely try the mattifying formula next.